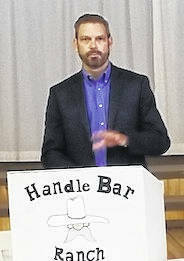 Gabrelcik speaks to the Morrow County Chamber luncheon Aug. 21. MOUNT GILEAD — Chris Gabrelcik has been offered buy outs from much bigger companies as his business Lubrication Specialties Inc. (LSI) has grown and received recognition for its specialty products. The early prospects for the business didn’t always look so rosy. LSI owner and founder, Gabrelcik took the Morrow County Chamber of Commerce audience through the years of struggle and success in his business when it went from a pole barn by his home on County Road 109 to the multi-million dollar facility on State Route 95 at I-71. Gabrelcik’s speech at the Aug. 21 Chamber meeting focused on the importance of “working on your business as well as in your business.” He spoke about the transition he underwent, from being a “one man show” and doing all the sales, accounting and production himself, to learning about inventory management and understanding the cycles of business and cash flow. The Youngstown native’s biggest break came with his development of Hot Shot’s Secret for the Ford Motor Company. It was a great product, although it took a while to catch on in the marketplace. Another break came when he was able to expand sales to Tractor Supply Company and Rural King. “I was still doing all the work in the business myself,” Gabrelcik said. He eventually hired six employees, but that became a problem as long as the business still revolved around him. Everyone was still coming to him for all the answers and direction. A turning point was reading the book “The Five Dysfunctions of a Team.” He found that regular meetings were the key to having good communication and cooperation among the team. “When all the business revolves around one person, you find yourself doing all the things you don’t want to do,” Gabrelcik said as he described handling day-to-day details. The company continued to add orders and moved from the location on Neal Avenue to the present location on SR 95. Once again he found it was an occasion to work on his business and step aside to look at the vision and purpose of the company. Another change came when Tractor Supply offered a contract with a big order. He decided instead of taking the order, to stay with the specialty products the company develops that had led to their first success. The next step was to see how the business could go on without him as it grew from a $5-$6 million dollar company toward the $10 million mark. He feels confident that it can operate without him as sales, production, research and marketing teams gained in strength. The next level for LSI will be strategic partnering with other companies such as John Deere and international companies in Brazil and India. Brad Ebersole of Consolidated Cooperative asked Gabrelcik to talk about his interest in reading. “Books change lives,” said Gabrelcik, referring to books he had used when he ran into problems or researched for his products. For information about LSI and their products see their website: www.lubricationspecialties.com.